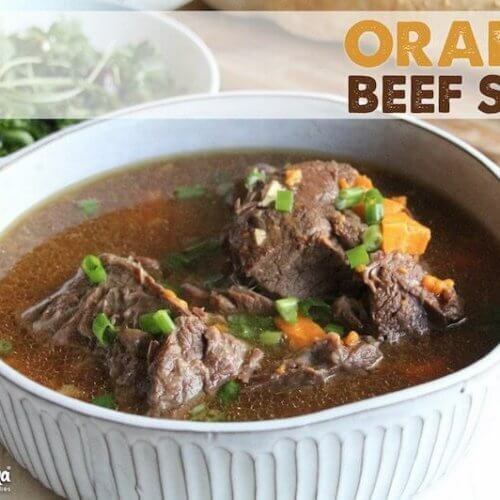 This hearty beef stew gets the "orange" in its name from the sweet potato chunks and orange juice used in the broth. Peel and chop the sweet potatoes into one-inch chunks and add them to the slow cooker. Roughly chop the scallions and add them to the sweet potatoes. Add the sugar, arrowroot flour, soy sauce, minced garlic, and orange juice and stir to combine. Add the roast, beef broth, salt, and pepper to the slow cooker. Cover and cook on low for 8 hours or high for 4 hours until the meat and vegetables are tender. Serve with fresh salad and homemade sourdough bread. This stew is an excellent freezer meal. Combine all the ingredients except the roast and broth and freeze, then add to the slow cooker with the roast and broth and cook until the roast is tender and falling apart. You can make several batches at a time and freeze them so that you have several meals ready to go.